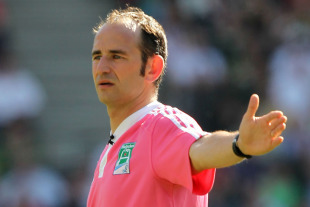 French official Romain Poite has been handed the honour of refereeing this season's Heineken Cup final between Leinster and Northampton at the Millennium Stadium on May 21. The 35-year-old will be officiating at the showpiece event for the first time, having already been named among the 10-man elite referees panel for the Rugby World Cup. Poite took charge of an Anglo-Irish contest two weeks ago in the semi-finals of the Amlin Challenge Cup, where Munster were thumped by Harlequins amid crowd unrest at some of the referee's calls. Irish referee George Clancy will whistle the Challenge Cup final on May 20, with Quins up against Stade Francais at the Cardiff City Stadium.